"It looked as if the whole column were composed of rings or layers, and when a higher ring moved on toward the southeast, the ring immediately below slipped over to get back under it. This rippling motion continued on down toward the lower tip (28). 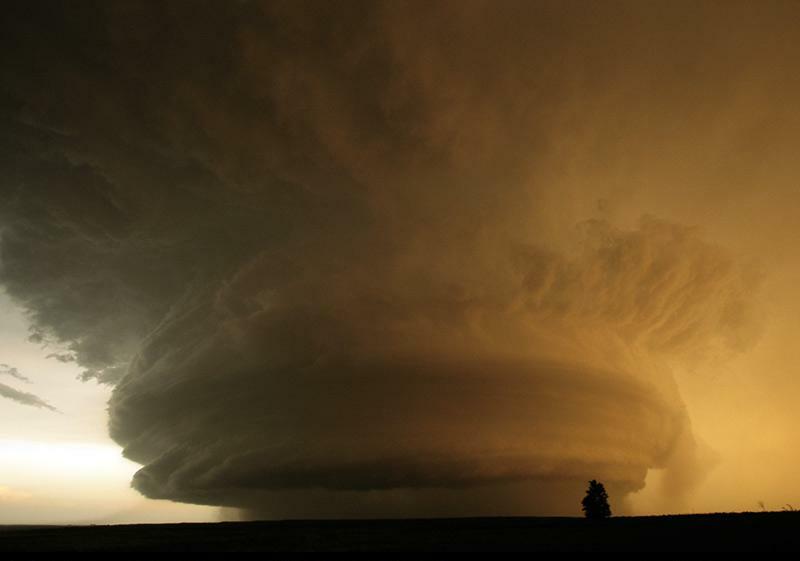 "It is quite rare that people have been inside tornadoes and survived. It is rarer still that people would be observant inside a tornado, and even rarer that an experienced weather observer would be so observant. It is quite rare still that a person’s report of experiences inside a tornado would be published as widely as this was in a national meteorological magazine. So personal experiences like these described here should be deeply pondered by those wishing to understand this phenomena. Reports like these probably rarely make it to national publication." 28. R. Hall, Inside a Texas Tornado, Weatherwise, Vol. 4, no. 3, 54 (June, 1951). ElecGeekMom wrote: OK. I finally found a photo that was posted on Facebook, showing the tornado that came down near Tulsa yesterday. It shows the kind of stair-steps I was talking about. This is very similar to what I saw on TV when I was watching the storm coverage for the Moore tornado. I totally agree that cloud-base striations are evidence of electromagnetism. They look like they are formed by rotary motion. The fact that the striations are separate & distinct from the inflow in the wall cloud (or outflow in shelf clouds) begs us to believe that such rotation outside of the flow could be caused just by friction with the rotating flow. 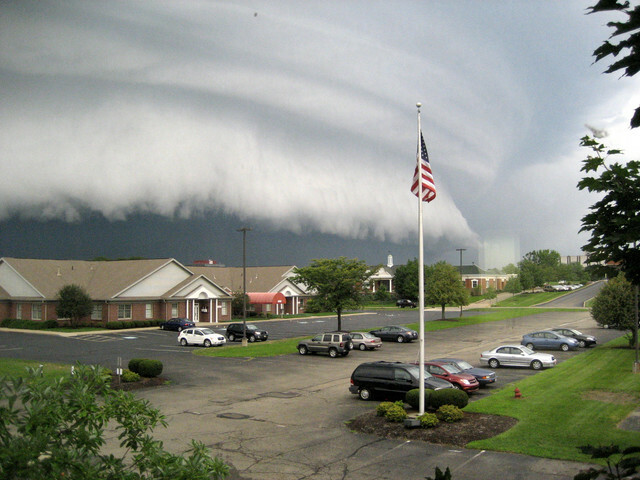 But the wall (or shelf) clouds aren't showing the same rotation. So how could the ambient air get spun up by friction with a rotating column of air that isn't rotating? IMO, a fluid dynamic explanation just isn't going to work. So I'm of the opinion that these structures indicate the gyroradius of the magnetic field produced by moving electric charges. The magnetic field isn't actually strong enough to accelerate particles around the center, but it is powerful enough to orient the water molecules, and this encourages condensation. Hope you and your loved ones weren't hit by today's tornadoes in Oklahoma City. And please tell other concerned citizens in your area about the work that I'm doing. With existing meteorological methods, the reliability of tornado warnings will never improve, because the forecasters aren't even looking at the essential ingredients for tornadogenesis (i.e., electromagnetism). Only with a more accurate theory will progress by made, and that will save lives. 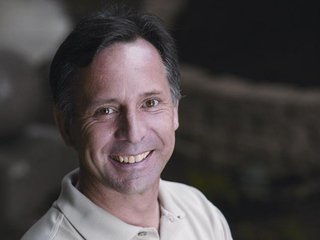 Tim Samaras, his son Paul Samaras, and his chase partner Carl Young were killed in the El Reno tornado on Friday. Tim was an engineer who knew that we need better field data in order to understand why tornadoes can be so destructive. He was responsible for the first-ever barometer readings inside a powerful tornado (i.e., the F4 in Manchester, SD, 2003-06-24), which showed the largest pressure drop ever recorded on Earth (to this day). These data are crucial for tornado theory. 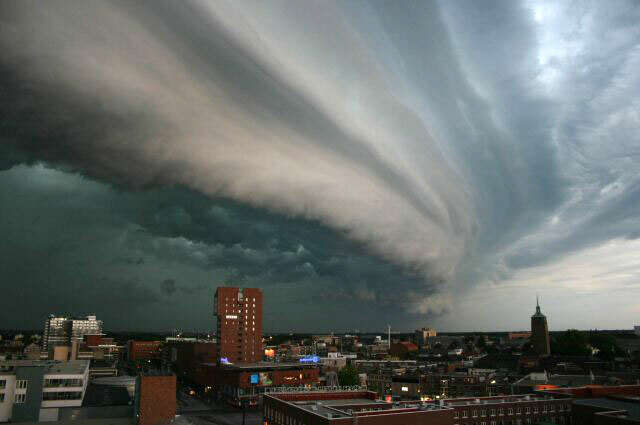 The well-known "funnel" shape of a tornado is caused by a pressure deficit that relaxes in the direction of the flow. 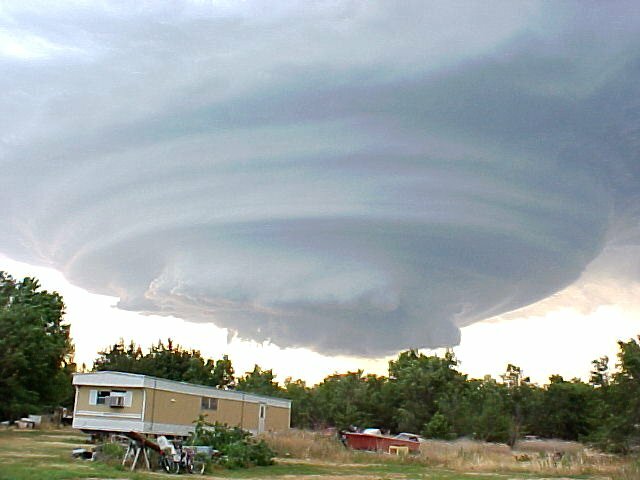 Conventional meteorology can't explain this, because it shouldn't be possible in a standard suction vortex. So this is the least understood aspect of all, and it figures centrally in my proof of another force in tornadoes, with the confirmation coming from Tim's instrumented data. Tim had a reputation for being more prudent than most storm chasers, so we shouldn't dismiss his death as just the expected outcome for an adrenalin junky, which he was not. His last tweet on Friday was typical of his attitude, "Storms now initiating south of Watonga along triple point. Dangerous day ahead for OK -- stay weather savvy!" But it's a simple fact that if you chase tornadoes for 30 years, sooner or later something will go wrong. Things aren't so risky for the tornado sensationalists who are out there just to get videos that they can sell to the TV stations -- they can get decent video from 1/2 mile away. But due to the unpredictable paths of tornadoes, Tim learned that he had to get within a couple hundred yards to position instruments that would get run over by the tornadoes. He couldn't sell the data to any TV station, but Tim kept doing this work anyway, because he knew that it would help save lives. In the end, he gave his own life so that others may survive. Rest in peace, Tim, and thanks. I saw that on the news today. It is a shame his expertise is lost. 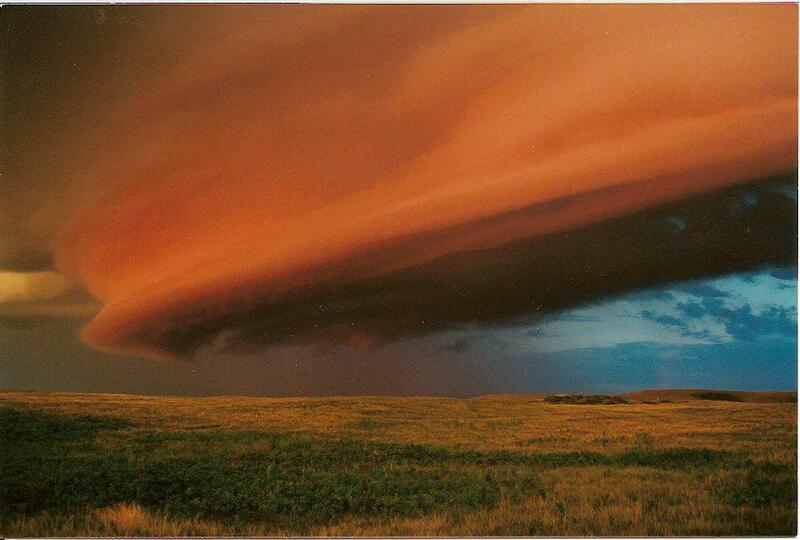 Here is another shelfcloud image. 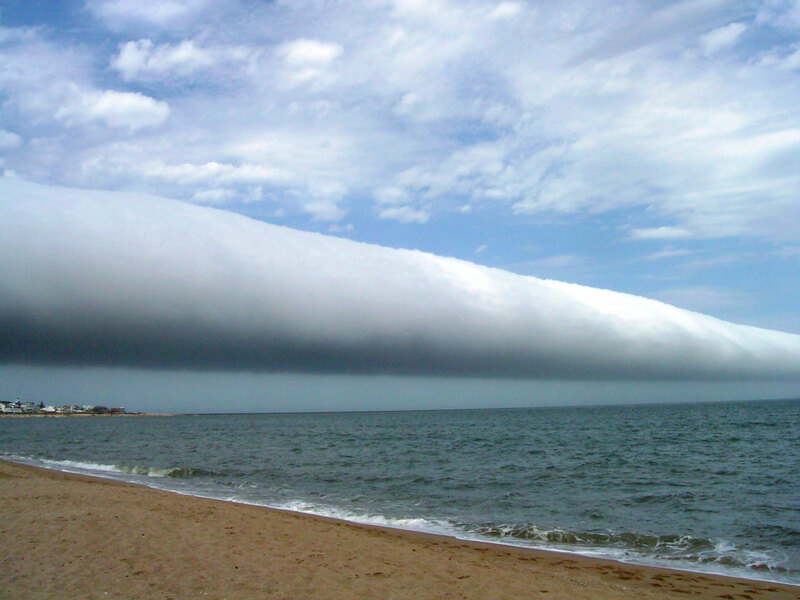 Interesting that in this photo, the rollcloud has a spiral-like appearance. I suppose that could be explained in any or many of several ways. I am not suggesting that all tornados are formed by the means I described, however, I do propose that water is entering the atmosphere and when sufficiently large masses of it do so they bring with them the electro/magnetic and inertial (rotational) components that lead to tornados and other weather phenomena, depending on the myriad of other local planetary influences. "The source of the display was an interplanetary shock wave, which hit Earth's magnetic field during the late hours of May 31st. Forecasters still aren't sure where the shock wave came from. Current speculation focuses on a corotating interaction region (CIR)-a shock-like transition zone between slow and fast streams of solar wind. Whatever it was, the impact ignited some beautiful auroras." Anyone know what time the tornado turned in the direction of the storm chasers? Check out the Jet Stream maps for the time periods of the OK tornados. If you do so today you will be able to see an animation for the last six days which will start on 29 May. Archived maps can be viewed individually but not animated. It shows a start time of 6:03, and an ending time of 6:43. It looks like it might have been 6:20 or 6:30 or so when it turned. Now what time did that CME hit? Here's a puzzler for our friend Charles. Please explain the anti-cyclonic tornado accompanying the El Reno twister. Dotini wrote: Please explain the anti-cyclonic tornado accompanying the El Reno twister. Unlike some of the other EM tornado models, mine doesn't invoke any sort of Lorentz force to induce rotation, because air just isn't very responsible to magnetism. So rotation can only be the consequence of surface inflow vectors. If the air's general flow happened to be to the right of a surface low (facing in the direction of the flow), that momentum plus the inward force of the surface low resolve into a CCW spiral. If the pre-existing momentum was to the left, a CW spiral forms. In the chaotic mix of updrafts, downdrafts, and surface flows under a large thunderstorm, both conditions might be present. Here is an interesting NASA statement and the associated NASA ScienceCast video about the recent uptick in Noctilucent Cloud activity. From Wikipedia: There has been major solar flare activity in early 2013, notably within a 48 hour period starting on May 12, 2013, a total of four X-class solar flares were emitted ranging from an X1.2 and upwards of an X3.2., the latter of which was one of the largest flares of the year so far. Do you find it a coincidence there was a period of major solar flare activity beginning May 12, 2013 and an early appearance of Noctilucent Clouds on May 13? Is it further coincidence the tornado outbreak in the US started May 15? "Some of the water may be made right there on the Moon," says Spudis. "Protons in the solar wind can make small amounts of water continuously on the lunar surface by interacting with (Oxygen) metal oxides in the rocks. But some of the water is probably deposited on the Moon from other places in the solar system." I find it peculiar the solar ejecta - the solar wind, solar flares and CME’s - contain the H and O and electrons that will combine and make H2O - and now we have an officially uttered presumption that the solar wind and “impactors” are sources of H2O on the Moon - but there seems to be a hesitance to connect the dots and realize the same circumstances are a (the) source of water on Earth. This is interesting however I don’t see attribution to the author. Who wrote it? It seems to corroborate my first post in this thread with the description of electrical forces causing tornado formation. The planet is gathering up charged mass from the solar wind and CME’s, much like making cotton candy, the Sun is the spinnerette spewing the molten sugar and the earth’s magnetosphere is the rotating stick gathering up the sugar. showing a fire tornado that forms over a brush fire. It then moves over water and intensifies. I posted a comment there that this seems to falsify the mainstream explanation of fire vortices as being caused only by rising hot air.